There are no Senior Methodist Ministers in Fiji who are at liberty to travel overseas because of the risk that they may tell the truth and espouse unfavourable views of the current military junta led by the murderer Josaia Voreqe Bainimarama. This travel ban does not apply to Rev Akuila Yabaki, who was dismissed from the pulpit by the Methodist Church of Fiji and Rotuma in 2001. But he continues to use the title Reverend. Rev Yabaki is free to travel overseas and to espouse the asserted merits of the illegal junta. He also purports to represent Non Governmental Bodies in Fiji. 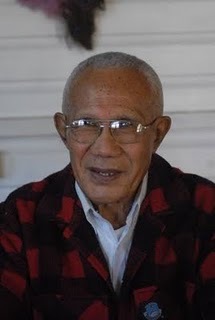 Rev Yabaki turned up in Auckland at the 2011 Pacific Islands Forum meeting, and sought to distribute copies of the discredited Lowry Report, which ridiculously purported to give high approval rankings in Fiji for the current military dictatorship. Recipients placed the reports in bins as fast as the enthusiastic Reverend was keen to hand them out. He also turned up at the recent Commonwealth Heads of Government meeting submitting that the current junta has sincere intentions to hold democratic elections and that Australia and New Zealand are blocking the elections from being held. Yabki’s submission does not stand up to scrutiny. The current illegal junta and its election promises are insincere virtually by definition and if there is any blocking done by Australia and New Zealand then it is a blocking of "incredible" elections. They will not block any credible elections. (i) Who gives him freedom to travel? (ii) Who is funding him? (iii) Why can not other clerics freely travel and freely speak? Ratu Tevita Mara, in Perth, distributed a submission document to CHOGM and held successful meetings with a number of delegates yesterday to update them on the Fiji situation. The submission document is from all Fiji Democracy and Freedom Movement (FDFM) groups. At CHOGM the leaders have already agreed to give the Ministerial Action Group and the Secretary General more powers to speak out if member states deprive their citizens of human rights or threaten the media or judiciary. They can also speak out if democracy is threatened through postponing elections. And, the Action Group will be empowered to police election rigging and the detention of political leaders. The Commonwealth Secretary General Kamalesh Sharma (Pictured) says the Australian Prime Minister Julia Gillard's work was key to getting the reforms approved. The long time Dictator and Tyrant of Libya, Colonel Moammar Gadhafi, is dead. Gadhafi was killed on October 20 while trying to flee his home town of Sirte where he was with troops loyal to him. He was captured, killed and his body dragged through the streets. Gadhafi paid the ultimate price after 42 years when revolutionary fighters across Libya, made up of engineers, doctors, teachers, businessmen – the everyday people, united to end Gadhafi's evil dictatorship. Moammar Gadhafi paid the price that Dictators and Tyrants pay...untimely death. What Gadhafi did to others was meted out to him. One by one, Dictators and Tyrants, having run their gamut, meet their end, one way or another. Perhaps the first to go was Saddam Hussein of Iraq. He was hanged. In Tunisia, the President was forced to leave. In Egypt, President Hosni Mubarak was forced to resign. He is now languishing in jail awaiting trial. In Syria, President Assad is facing internal strife and his long rope of tyranny is also nearing its end. What will be the murderer Bainimarama’s fate? Will he be toppled by a revolution or rebellion by the people, organised or not organised? Will he be removed by an internal Military Coup in which officers and soldiers, loyal to the country and true patriots, who are in the vast majority, carry out their own Coup, arrest Bainimarama, Khaiyum, and their gang of thugs and conspirators, bring them to justice and return the country to freedom and democracy? Will he be shot and killed by a soldier at Military HQ or at a public function by a private citizen fed up with evil that has taken hold in the Army or across Fiji? Will he meet a fate similar to Gadaffi? It may be that the event of October 20 and the fate of Moammar Gadhafi is a portent of things to come. When such a prodigy so auspiciously occurred, it may be a sign of what is about to happen, one way or another, in Fiji. Today, however, a fresh cloud darkens the future of Fiji. That cloud is Bainimarama's evil dictatorship and junta, which now controls all aspects of life in Fiji at the barrel of a gun. A reign of terror exists in Fiji; corruption is rampant; and so is poverty. Promised elections in Fiji have no credibility as holding credible elections would expose the current unlawful rulers to prosecution. The junta and all its actions have been held to be illegal, by Fiji’s Appeal court Ruling of 2009. The current Fiji judiciary is not independent. Fiji remains excluded from international institutions on account of its sharply deteriorating human rights record and failure to take credible moves towards democratic elections. Unions, churches and anyone else putting up their hand in protest are harassed and persecuted. The media is totally controlled. Central administration is totally dominated by army officers, their relations and friends and quislings. Fiji WAS independent but NOT now. Fiji is is bound in the shackles of a military dictatorship led by the murderer Bainimarama. The blog site Coup 4.5 exposed the illegal AG Khaiyum’s title of Acting Prime Minister that is set in stone in the official Plaque commemorating the opening of the Fiji National University Film and TV studio. This use of the title, of Acting PM, portrays the illegal, power-hungry, Aiyaz Khaiyum’s clandestine ambition. It also broadcasts a signal of things to come. The power-drunk and money-grabber Khaiyum, through the Plaque, is sending a loud and clear message to all and sundry, including his tyrant boss, the murderer Voreqe Bainimarama, that he (Khaiyum) intends to become, by hook or by crook, the next Prime Minister of Fiji. Acting as Prime Minister is only the first step. Khaiyum intends to continuingly act as Prime Minister of Fiji whenever the murdering dictator is absent from the country. This is Khaiyum’s next steps. The people of Fiji and the countries of the South Pacific and the world all need to be clear that Bainimarama is not Prime Minister of Fiji. The Fiji Court of Appeal ruled, in its historic judgment in 2009, that the 5 December 2006 Military Coup was illegal, the Military junta that replaced the SDL Government was illegal and all acts by it are illegal. Consequently, the ruling junta led by Bainimarama is illegal and thus is not the Government of Fiji. Ipso facto, Bainimarama is not the Prime Minister of Fiji. And therefore, Khaiyum is not the Acting Prime Minister of Fiji nor is Khaiyum Fiji’s Attorney-General. In addition, according to informed sources, Khaiyum never informed his boss, the tyrant Bainimarama, of his (Khaiyum) plan to have the Plaque made and mounted. If this be true, then it was a self-enlightened move, by Khaiyum, to show Bainimarama who is the real boss of Fiji. Since the December 2006 Coup is illegal and the regime is illegal, its 2009 Decree abrogating the 1997 Constitution of Fiji has no legal standing, is illegal and is null and void. The fruit of the poison tree is also poisonous. The 1997 Constitution is the supreme law of Fiji. In the High Court rulings, the Prasad case being one, one of the Judges wrote that a Constitution is immutable and cannot be abrogated. The 1997 Constitution of Fiji is still valid. The 1997 Constitution, in Article 98, provides that Fiji’s President shall appoint as Prime Minister “the Member of the House of Representatives who in the President’s opinion can form a Government that has the confidence of the House of Representatives.” The same provision is contained in Fiji’s 1970, 1990 and 1997 Constitutions. Fiji has no House of Representatives. Bainimarama was not then, or never was, a Member of the House of Representatives. This being the case, Bainimarama cannot be Prime Minister and he is not the Prime Minister of Fiji. Khaiyum cannot therefore be Acting Prime Minister. The Plaque therefore dubbing the terrorist and former bomb-maker and Fiji’s illegal Attorney-General as the Acting Prime Minister is really, as previously stated, a sign of things to come. The ultimate and sinister plot of the murderer Bainimarama and Khaiyum is to retain power by hook or by crook until they die. They are considering, subject to events and circumstances, to conduct a fraudulent and crooked election process in 2014. The ins and outs of that proposed election fraud were explained in a previous blog. With a dubious and fraudulent victory assured by the murderer Bainimarama and Fiji’s Taleban terrorist, the plan, according to insiders, is for Khaiyum to be made Prime Minister and Attorney-General and the murderer Bainimarama to be made President of Fiji. And the two will rule Fiji forever. The Plaque, commemorating the opening of the Fiji National University Film and TV studio, is only a snippet of the coming event. It also casts an evil shadow, loud and clear, that Aiyaz Khaiyum is Acting Prime Minister now, and will be Prime Minister later. With Khaiyum as Prime Minister Fiji is doomed to destruction, just like Sodom and Gomorrah in the Bible, especially when Khaiyum’s illegal acts wear the false cloak of legitimacy and democracy. With this false cloak the rule of law, human rights and justice all become just words and Fiji, as a country, is doomed. The Public Debt has surpassed 50% of the GDP and is higher than most regional neighbours. E dua na i vosavosa vakamatua e dau tukuni tu na nona butakoci na dau butako e marau kina ko lomalagi .E daidai e ra reki mai Lomalagi .Ia, kevaka na “Mahogany” e Viti sa butakoci me ra vakalolomataki kina na dravudravua,o ira na i taukei kei na vanua,e na reki talega vaka kina na vanua taucoko. Na Mahogany levu duadua e na noda vuravura e ra taukena na i taukei ni vanua e Viti.E ra sa vakalolomataki na i taukei ni vanua mai na nona vakaveitaliataka, vakatawa dodonutaka na i yaubula ni vanua na dau ni Lawa,ka Minisita talega ni veika vaka-Bisinisi ko Aiyaz Khaiyum, me nanumi koya ga vakai koya e dua na i nakinaki ka nanuma ni sega ni bau kidaca na nona i liuliu ko Voreqe Bainimarama. Na dau vei vakacacani ka mai taura vakatawa dodonu tu na veiliutaki o Bainimarama e dau raica talega o koya me dau tu na nona i votavota mai na vei butako lelevu kece sara.Na nodrau vakaduiduile kei na cala ni nodrau veiliutaki o Minisita Khaiyum kei Bainimarama,rau vakatavitaki rau e na dua na veivosaki vata kei na kabani mai Amerika, na (US Company)(Gibson Guitars) me volia na Mahogany mai na noda vanua. Sa mani mau na veivosaki ka sa vakarogotaki e na noda vanua e na i 22 ni Seviteba.E dua na ka levu a qai yaco e na nodratou mai kidava ka raica na dina na kabani oqo baleta na nodrau i vadi ca. ka mani sega ni vakavatukanataki na veika e ratou a bosea kei na turaga e rua mai Viti.Sa mai suruta wale na vusi....E na dina ni veitalanoa na veika sa yaco e kauta mai na madua kei na cudru vei Bainimarama.Sa rui mositi koya dina ni nanuma na veika e na rawa kina. O koya e dua na vutuniyau(billionaire) dau butako.Na nona loma kocokoco e se sega ga ni rauti koya na veika e sa taukena tu.E na nona i naki ca a mani kovea kina na nodra i yau na lewe ni vanua ka butakoci ira talega na dau musu vakacavacava e na noda vanua oqo ko Viti.Na veika vakailavo nei Bainimarama e maroroi tu e na kaude nei koya nadau ni vika o Nur Bano Ali na vugoi Khaiyum na dau verevuni. Na muslim ka minisita ni veika vaka bisinisi o Khaiyum a sega sara ni bau kila na nona liumuritaki koya tale na nona i tokani o Bainimarama, o ya na kena volitaki na Mahogany ki na kabani na Gibson Guitar .Sa dua na ka nona kidroataka, kidacala e na veika sa mai rogoca. Na veivosaki vakatawa dodonu a vakayacora o Khaiyum me baleta na kena maketetaki na Mahogany i ‘Mega Maderas”na kabani oqo e tiko i Guatemala, mai Amerika.Na kabani oqo e sega mada ga ni bau rogoci tu se kilai e na vanua vaka- Guatemala, ia,e a mani dolavi ga vakatabaki dua e na kena volitaki kina na Mahogany mai Viti Na veitalanoa oqo e sa vakayacori sara e na yabaki 2006 na gauna ka vuaviritaka kina na matanitu o Bainimarama.E tukuni koya vaka i koya me ‘Fine Timber Exporters” na ka e vakaraitaka na “youtube video promotion” ni a caka vakatabakidua me baleta na kena maketetaki na mahogany e Viti.E sa caka tiko mai na volivolitaki i Maderas ka sa mai taura tiko na kena uro vakatawa dodonu o Khaiyum e rai sega beka ni kila o Bainimarama. Sa rauta mada...sa kena gauna oqo me ra sa yadrava na i taukei na veika lelevu a mai cakava tu o Bainimarama na veivakalolomataki,na veibutakoci kei na kena kovei vakatawa dodonu na i yaubula nodra na i taukei. Me vakayacori na ka oqo me baleta na kena rokovi na tikotiko vakaturaga kei na Bose Levu Vakaturaga.Sa mai vakacacana ka cala na nona nanuma se vakatulewataka na veiliutaki ni lotu Wesele kei ira na kena i talatala.Sa raici sara ga na nona vakaveitaliataka, butakoca na qele ni kawa i taukei e na ruku ni “Ponzi scheme”se vakatokai na “Land Bank”.E ra sa sotava na dravuadravua ni bula na i taukei,na kena sega ni sotavi rawa na i sau ni bula e na veisiga ia o Bainimarama sa qai mai wavokita na noda vuravura vakaitikotiko e na otela kana vata kei ira na yavatu rawa ni da kaya ni sa bula vaka na –tui. nona i vukivuki.Sa sega ni rawa ni ra vosota tiko na i taukei na kena kovei na nodra i yau, qele kei na nodra dodonu. Sa dodonu me rauta ka tarovi. Sa kena gauna oqo o ira kece sara na gone i taukei i Viti, ka lewena tiko na mataivalu kei na ovisa me ra lomana na vanua kei na kena uma tamata ka toso ki liu me ra taqomaka ka karona na bula ni veisaututaki e na vanua o Viti. Sa dodonu me sa muduki na bula ni veivakacacani, kocokoco,,dravuavua,na kena tubu cake vakasauri na tawa cakacaka ka me da vakanamata e na gauna vinaka me da lesu tale ki na dodonu ni tamata yadua,na veidigidigi,vakarurugi e na dua na matanitu e digitaki ka koto kina na dina,savsava kei na veiliutaki vinaka. ME DA VEITAURI LIGA KA TOSO KI LIU!!! TOU VIRIA NA BAI KEI VITI!!! There is an old saying that “when a thief thief from a thief, there is laughter in heaven”. Today, there is laughter in heaven. And if the heinous Fiji mahogany plantations robbery was not so tragic for the poor, indigenous Fijians and for the country, the nation would also be laughing. The precious valuable Fiji mahogany plantations, the largest in the world, which are owned by the poor, indigenous Fijians, are now being despoiled and robbed by the illegal Attorney-General and Minister for Public Enterprises, Aiyaz Khaiyum, for his personal gain, an act he thought was unknown to his boss, the dictator and murderer Voreqe Bainimarama. The brutal tyrant and murderer Bainimarama obviously found out and attempted to get his share of the loot. 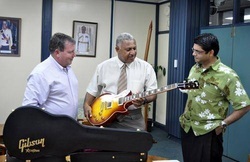 In an underhand move for corrupt gain and unknown to the illegal line Minister Khaiyum, Bainimarama entered into discussions with a US Company, Gibson Guitars, to sell it mahogany. Negotiations were finalised to conclude the illicit deal and announce it at a Press Conference on September 22. However, the Company’s owner found out the truth about the corrupt, bribe-prone and repressive junta of the murderer Bainimarama and pulled out. The murderer Bainimaorama was shamed, embarrassed and angry over the subsequent turn of events. According to reports, the deal fell through because the murderer Bainimarama wanted too large a cut for himself. The murderer Bainimarama is a billionaire crook. His greed and avarice are not satisfied with his Emperor’s salary, illegal millions he swindled from over 30 public projects and what he has stolen from Fiji taxpayers. The murderer Bainimarama’s money is all stashed away in an off-shore bank account being handled by accountant Nur Bano Ali, the aunt of his criminal associate, Khaiyum. In his underhand move to sell the mahogany, he had no thought whatsoever for the indigenous Fijians who own the plantations, or for their families, for the indigenous people as a whole and for the benefits that would accrue to them, their lives and their upliftment if the resources were marketed in a transparent and accountable manner. THIS CLEARLY DEMONSTRATES THAT BAINIMARAMA ONLY CARES FOR POWER, FOR HIMSELF AND FOR HIS FAMILY. NOT FOR THE FIJIAN PEOPLE. BAINIMARAMA MUST GO. The Muslim and illegal Fiji Minister for Public Enterprise and line Minister, Khaiyum, was blissfully unaware of the backhand move by corrupt partner Bainimarama to sell the mahogany to Gibsons Guitar. Imagine his shock and surprise when he found out. I was half expecting the illegal AG to have Bainimarama suspended! The illegal and corrupt Khaiyum has been getting his kickbacks and graft from Mega Maderas, a company located in Guatemala, Central America. The company is unknown outside of Guatemala and was opportunely created mainly to market Fiji’s mahogany. It is significant and instructive that Maderas was set up in 2006, the year of Bainimarama’s Coup. Maderas advertises itself as 'Fine Timber Exporters’ but when you listen to a youtube video promotion, it was set up just to market Fiji’s mahogany. It has been doing so for some time now. Khaiyum has been getting his kickbacks from Maderas unknown, or so he thought, to Bainimarama. It is high time that the indigenous Fijian people wake up to their ruthless oppression, repression and robbery of their prized possessions by the illegal Bainimarama junta. 1. done away with their respected and paramount Fijian institution, the Bose Levu Vakaturaga. 3. turned now to stealing Fijian ancestral land under a Ponzi scheme called a Land Bank. The Fijian people are living in poverty while the murderer Bainimarama travels around the world staying in posh Hotels and feasting at international dining tables. The murderer Bainimarama, who was sacked and then forced PM Qarase to renew his contract, is living a lifestyle of the rich and the infamous. Indigenous Fijians cannot and must not continue to tolerate this robbery of their rights, their money and their land. They must put a stop to it. It is high time that the Fijian police and soldiers loyal and patriotic to Fiji take steps to end Bainimarama’s evil. You and your families are suffering. YOU have a duty and obligation to your country and to your families. Fiji needs You. It is time that the tyranny, absence of law and justice, corruption, economic and social decline and the rise of unemployment and poverty end now. It is high time that freedom, democracy, the rule of law, Constitutional rule, Parliamentary Government and economic and social growth are restored to Fiji. Our beloved country. There is an ancient proverb, attributed to Euripides, which is so applicable to the murderer Bainimarama (as displayed in picture on left). It says, “Those whom the Gods wish to destroy, they first make mad”. Here is an example of that madness. Land degradation, coastal, is a result of ocean tides that the illegal junta has tragically failed to address during its five years of repression. What is interesting is that Fiji is a Member of the UN Desertification Commission although it has no deserts. It would also be interesting to know what annual financial contribution Fiji has to make to the Commission, not to mention the sums of money spent for travel and subsistence to attend meetings. The illegal dictator and murderer preached at the UN to member countries about integrated water resource management when Fiji has no such programme in place, especially for the rural areas where two-thirds of the indigenous Fiji population live. What Fiji does have is a lack of pure water supply or piped water. Drainage and poor sewerage systems and irrigation remain serious problems. Rural electrification is almost absent and interconnecting roads, bridges and transport between villages and districts almost non-existent. A high percentage of indigenous Fijians live in rural areas under primitive conditions while the murderer and his cohorts live in expensive Government funded accommodation and travel the world living in expensive hotels. The land degradation in Fiji applies generally to the coastal areas that surround the islands. It is caused by the Pacific Ocean tides. So while pontificating to UN members about coastal use planning, the murderer Bainimarama has failed miserably to pursue policies, plans, programmes and projects to prevent coastal degradation in Fiji. Instead of the murderer Bainimarama preaching about; deserts, which Fiji does not have; drought, which occurs in Fiji due to the junta’s failure to act; and coastal degradation that has not been addressed, he should have been talking about more relevant topics to Fiji. This includes increasing levels of Overseas Development Assistance to Fiji, facilitating more export trade, increasing foreign private investment, and attracting higher levels of tourists and transfer of technology. In addition, the murderer Bainimarama should have been telling the UN about the end of his Public Emergency Regulations in Fiji, and the end of media muzzling, censorship, and the return of the rule of law and the fundamental rights and freedoms of the individual, and the restoration of Constitutional rule and Parliamentary democracy to Fiji. Therefore, I find the ancient proverb, “Those whom the Gods wish to destroy, they first make mad”, so applicable to the murderer Bainimarama and his statement to the UN. E nai ka lima ni Tiseba 2006 ena gauna e mai vuaviritaka kina na Matanitu o Voreqe Bainimarama na turaga e leveca tiko na nodra labati na sotia ena 2000, me sa taura na ulu ni veiliutaki ena bose lawa, a mai vakadaberi Aiyaz Khaiyum edua na loya me sa taura nai tutu vaka vunilawa ni noda vanua. Ni oti e lima na yabaki mai na gauna koya sa qai mai kune votu tiko ni sa liutaka tikoga na Matanitu veivakatotogani oqo ko Aiyaz Khaiyum. E dua na qito vakadomobula e vakayacora o Khaiyum ena nona saga me cabeta nai tutu vakaveiliutaki ena nona vakaqumi na liga daulaba nei Bainimarama. Tekivutaki na nodrau veiwekani ena nona soli koya vakarawarawa vei Bainimarama o Khaiyum ena vakacegui koya ena veigaunisala vaka politiki ka vakalawa talega me yacovi kina na nona maroroi na daulaba. E mai rawai Bainimarama o Khaiyum me tauri vaka tikoga na Matanitu na yavu ni vakavulewa ni 1997 ni oti na vuaviri me kua ni vakacacani kina na nona sema vaka lewe ni vanua e Ositerilia kei na nona bubului vakalawa mai keya. Ena kena mai taurivaki tikoga na yavu ni vakavulewa ni 1997, e kila vinaka tiko o Khaiyum ke mani kau vakaveilewai na Matanitu vaka i value na druka ga. Sa qai vakayagataka edua nai vadi duka o Khaiyum me vakagalalataki na vosavakadua o Justice Fatiaki, me rawa ni vakasaurarataki na nona kere vakacegu na Turaga ni lewa qo. Ena nona sa vakagalalataki o Justice Fatiaki sa mani laki rogoci kina na kisi e kauta cake mai nai liuliu ni Matanitu vakasivoi o Laisenia Qarase vei Anthony Gates ka sa yalataki oti koto kina nai tutu vaka vosavakadua me taura. E mani yaco kina na vakatulewa ni mataveilewai nei Gates ni donu vaka lawa na vuaviri ena kena vakayagataki na yavu vakalawa ni veika e dodonu me vakayacori se “Doctrine of Necessity.” E vinaka ga ni sega ni vakatara na yavu vaka lawa oqo ena kisi ni laba me rawa ni galala kina o Bainimarama. Sa mai vakayacora kina o Gates na nona i tavi ena kilavata oqo. E mani bolea o Qarase na vakatulewa oqo ena mataveilewai e cake se “Appeals Court”. E na vakatulewa ni mataiveilewai e cake oqo e kaya kina na dau ni lewa ni cala vakalawa na vuaviri, na matanivakaivalu kei na veiveisau kece mai cakava o Bainimarama. E rau mai veicudruvi kina o Bainimarama kei Khaiyum ena veika sav aka taulewa kina na mataveilewai e cake. Sa qai kauta cake mai o Khaiyum nai wali ni leqa nei Bainimarama me sa boko na yavu ni vakavulewa, tauri vakaukauwa na ulu ni veiliutaki vaka Peresitedi ka qai buli nai vakaro vaka lawa mai na kaukauwa vaka Peresitedi se “Decree.” Sa mani yaco kina na lewa me vakayacori sara na nanuma nei Khaiyum. Ena nona sa kila rawa o Khaiyum ni sa rawai na vakatulewa nei Bainimarama sa qai tekivu me vakaukauwataki koya o na Turaga qo ena nona sa tekivu bulia cake na yavu ni nona veiliutaki. Kila vinaka o koya ni tiko e dakua Bainimarama na mataivalu ka sega vua, sa tekivu me vakayagataki ira na wekana mera dau ni vakasala ni Matanitu. E mai kerea na wekana o Nazat Shameem na nona vakacegu mai na mataveilewai me sa vakaduria edua na nona vale ni volavola. Vaka kina na tacina o Shaista Shameen e mai dolava talega edua na nona vale ni volavola. Vaka talega kina na nona nei o Nur Bano Ali kei na nona kabana ni dauni vika sa ratou duavata tiko ena soli vakasala. Sa mai vakabauta sara vakalevu o Bainimarama na veivakasala mai vei ira nai lawlawa oqo ka sa vakamalumalutaka vakalevu na lewa nei Bainimarama kei na mataivalu. Toso na sasaga ni lawalawa oqo me vakamalumalutaki vakadua o Bainimarama kei na Mataivalu ena nodratou tosoya cake nai sau kei na kena vaka i lavo taki na veivakatorocake taki ni Matanitu. Sa qai mai kunati Bainimarama tu nai lawalawa oqo ena loma ni qito vaka i lavo sa rerevaka tu o koya me biuta tani, lakolako ena beitaki vua na veibutakoci oqo. Sa qai vaka io taka talega o Bainimarama nai vakasala ni lawalawa oqo me soli vua na vei tabana ni Matanitu bibi ka kenai i naki me vakalailai taka na vakayagataki lavo ka sega tiko ni kila o Bainimarama ni sa vuaviritaka tiko o Khaiyum vakamalua na kaukauwa ni veiliutaki mai vua kei na mataivalu. Sa vakadonuya tuga o Bainimarama na vei vakasala kei na veitosoyaki kece e nanuma o Khaiyum. E mataboko vakalevu o Bainimarama ena i naki vuni nei Khaiyum ka sega ni vuli vinaka li me bau kidava na veika e vakalialiai koya tiko kina na nona i tokani. Sa qai mai toso vakamalua yani na lawalawa nei Khaiyum me ratou veisau taka na veika e kovuta na qele. E ratou kila vinaka nai lawalawa oqo ni ko Viti e vutuniyau duaduaga ena kena qele kani sai vurevure levu duadua ena noda vanua. Ni rauta e walusagavulu na pasede na bisinisi e Viti e nodra na idia, ka walusagavulu ka tolu na pasede na qele e noda nai Taukei. Sa nodra i naki makawa tiko na noda vasu mera rawata vakalawa na noda qele vaka i Taukei. Taumada me ra rawata na nodra i naki na noda vasu eratou rawai Bainimarama rawa nai lawalawa oqo ena veiliutaki nei Khaiyum me boko na Bose Levu Vakaturaga kei na Bose O Viti ka ratou kila ni tatao levu ni nodratou sasaga ena veigauna sa oti ena kena dau maroroya toka na Lotu kei na Bose Levu Vakaturaga na bai ni vanua o Viti. E sega sara tuga ni kidava o Bainimarama na sa boko tu na Bose Levu Vakaturaga me vaka na kena vakagalalataki na Palimedi ena 2006. Mai na nona na tuiraki Bainimarama tiko na vakayagataka sara o Khaiyum na matanivalu me vakatikitikitaka na veiliutaki e loma ni lotu Wesele Viti kei Rotuma. Mani sega ni yaco nai nodra i naki ena tikina koya. Sa mani veisautaka tale o Khaiyum nai walewale ni nodratou i le na noda vasu ena kena vinakati me vakayagataki na qele ena veivakatorocaketaki levulevu ni Matanitu. Mai tauyavutaki kina na Matabose ni Baqe ni Qele se “Land Bank.” E vakatulewataka o Khaiyum na tabana oqo. Sa Turaga vuku saraga o Khaiyum. E kila o koya ni sega ni rawa ni vakagalalataki i Bainimarama. E sega ni rawa ni liutaka na mataivalu o Khaiyum se rawa na kena vakatulewataki baleta ni vuni kaukauwa kei Viti e tiko ena mataivalu. Me rawata na nona i naki esa vesumona taki Bainimarama tuga o Khaiyum me vakatulewataka nai tutu vaka Komada. Sa vesu o Bainimarama, sa vesu vaka kina nai tutu vaka Komada, ni sa vesu nai tutu vaka Komada sa vesu kina na mataivalu ni noda vanua lomai o Viti. SAI KOYA SARA TUGA KOYA NAI RAIRAI KEI VITI NI KUA. Sa yacana wale tuga ni veiliutaki tiko o Bainimarama na kaukauwa sa tiko e ligai Khaiyum. Sa vakayagataki Bainimarama tiko o Khaiyum me vesuka tiko na mataivalu me rawa tiko kina na nona i naki ka lecava tiko na mataivalu na tikina oqo. E ra sa mai vesuki keda tu oqo na noda vasu ena kena vakamalumalutaki na vei yavu vaka i Taukei ka vaka Lotu me ra mai rawata kina na noda i yaubula sai koya na qele. Sa nodra i naki vuni nai lawalawa nei Khaiyum me serelaki keda na kawa i Taukei me rawa ni ra qaqa ena veidigidigi. Ena kena kau mai na misini kei ni walewale ni veidigidigi me vakadeitaka na nodratou qaqa ena 2014, ke mani yaco. Ni oti na veidigidigi ka qaqa nai lawalawa nei Khaiyum sana oti talega na vakayagataki nei Bainimarama. E ra na gole mai Sri Lanka, Niusiladi, Ositerilia mera mai cicivaki keda ena dua na gauna dredre. Ena 1987 e a liutaka tiko o Khaiyum nai lawalawa ni vakacabote bomu e lomai Suva me ra vakarusai kina na noda ni kua sa vakayagataki Bainimarama, na mataivalu kei na lawa me rawata kina na nodra i naki na vasu. NAI LILIU DINA NI MATANITU ENA GAUNA OQO KO AIYAZ KHAIYUM. NA TOTOLO GA NI NONA KIDAVA O BAINIMARAMA KEI NA MATAIVALU NAI VEIKA OQO NA KENA VINAKA VEI KEDA NA LEWE I VITI. Nai tukutuku e mai kaburaka na vunilawa o Aiyaz Khaiyum ena i ka ruasagavulu ka dua ni Seviteba vei ira na veimata ni Matanitu era vaka vale ni volavola ena noda vanua ka kaya ne “ e vinaka me biu e taudaku ni Matanitu na kena vakarautaki na veidigidigi me rawa ni savasava” e dua nai tukutuku lasu, sega ni dodonu ka vakamaduwa. Oqo edua nai vadi duka tale me ra dabui tu kina na veimata ni Matanitu e Viti ni na yaco na veidigidigi. E sega ni rawa ni vakatautauvata taka rawa o Khaiyum edua na Matanitu e vuravura e vakayacora tiko na tikina oqo. Na cava e sega ni Digitaki kina na United Nations, se Commonwealth, se European Union, se Peritania, Amerika, Ositerilia, Niusiladi se na Matanitu o Canada. E ra a rawa ni vaka i lavo taka. Ni soli vei dua na kabana ena rawa ni yaco kina na veivakaqumi kei na cakacaka vakailawaki. Me vaka na veika e yaco na kabani ni lawa ni Amerika ka vaka i lavo taka na Air Pacific na nona vola edua na dikiri se lawa i vakaro me vakamalumalumutaka na Unioni e Viti. E sega ni dua na dau veidigidigi e Viti e vakabauta na Matanitu vakaivalu oqo ena levu ni duka kei na cakacaka butobuto e yaco tiko kina. E sega tiko mada ni kila o Khaiyum nai balebale ni vosa na “Transparency”. E kena i balebale ni laurai makare ka rawarawa ni kilai. E rawa vakacava me laki caka mai vavalagi na vola yaca ni veidigidigi ka sega ni da kila e Viti na veika ena yaco mai keya, sa dua na tawa savasava levu. Na kena vakayagataki na misini ka sega ni dikevi mai vei ira na kena dau ena rawa ni veisautaki kina na macala ni veidigidigi. Ena moici na misini me qaqa nai soqosoqo ni politiki e ratou lewena tiko na Matanitu vaka i valu. Ena qaqa kina na pati nei Khaiyum. Ena sega ni dua na pepa ni veidigidigi se Ballot Slip ena vakarautaki mei vakadinadina. Mai na gauna e tu vakai koya kina o Viti me yacova mai ni kua edau i tavi tuga ni vale ni volavola ni veidigidigi na kena qaravi vaka savasava, vakamatau ka vakamatata na veidigidigi levu. Na cakacaka kece oqo edau caka ga e Viti, ka ra dau veitalanoa taka na vei pati vaka politiki ka yaco kina na nodra veivakadonui. Na noda yavu ni vakavulewa kece mai na 1970, 1990 kei na 1997 e virikotori toka kina na tikna bibi oqo. Na cava e via mai vukica tiko kina o Khaiyum na veika oqo? Na vuna talega kina ya e mai bokoci kina na yavu ni vakavulewa me rawa ni moici kina na macala ni veidigidigi me ratou qaqa kina. E sega talega ni rawa ni na savasava na veidigidigi ena 2014 ni sega ni vakatarai tiko na vakasosoqoni vata, galala ni vosa, bose vakapolitiki kei vei soqosoqo tale eso. E ra na cicivaka beka li na mataivalu na veidigidigi? E sa dua na lawaki ca levu ni saga tikoga o Khaiyum me liutaki Viti. E dodonu me saqati ka vakuwai vakadua na sasaga ni Matanitu vaka i valu na kena biu e taudaku ni Matanitu na cicivaki ni veidigidigi. Fiji’s illegal Attorney-General Aiyaz Khaiyum’s statement (of September 21) to the Diplomatic Corps in Fiji that “it’s better to outsource (election voter registration) as it creates transparency” is another scam, dishonest and despicable. To all intents and purposes, it is another subterfuge to con Diplomatic Representatives in Fiji that the 2014 elections will be free and fair. The illegal AG Khaiyum neglected to name one country in the world that outsources the arranging and conducting of its National Elections. Why did the illegal AG not select the United Nations, the Commonwealth, the European Union, the British, American, Australian, New Zealand or Canadian Governments to handle the elections? They may even finance it. Private companies can be bribed or bought if the price is right, and, who knows, the price may be right just like the price paid to an American Law firm through a public owned Fiji company, to write the iniquitous anti-Trade Union Decree. The only voters in Fiji who have faith in and trust the Military Junta belong to the families of the murderer Bainimarama and the illegal AG and their cohorts. Everyone else regards the regime as totally corrupt. The illegal AG Khaiyum likes to use the word transparency but he and the junta do not practice it. The word transparency refers to the quality that makes something obvious or easy to understand. So how will outsourcing voter registration to a private company be easily seen, open to questions and be easily understood by the Fiji voters? The illegal AG Khaiyum’s whole idea and plan for outsourcing the voter registration, if it is done, is to prevent openness and transparency. The use of voting machines, supplied by overseas companies, that are not inspected by any international and independent professional electronic engineers reeks of fixing. The machines can and will be rigged by the illegal AG’s preferred supplier to ensure the junta’s selected Political Party wins the election. Since there will be no Ballot Slips to mark, will the voting machines print and issue a paper slip receipt to show the voter the accuracy of their vote? On the basis of transparency, fairness, openness and accountability, there must be a paper slip receipt issued by the machine to satisfy the voter. These paper slip receipts will also need to be signed by the voter and all collected and counted by an independent international body. The total count of the paper slip receipts should equal the total electronic count. From our independence to today, the Office of the Supervisor of Elections was responsible for arranging and conducting all General Elections in Fiji. The Office of the Supervisor of Elections is also responsible to ensure fairness, honesty and independence. All this work was done in Fiji and subject to consultation with all Political Parties, discussions and inspection. In fact, the 1970 Constitution, the 1990 Constitution and the 1997 Constitution contained such requirements. Why then is the power-hungry Khaiyum changing the system. This also provides another reason why the 1997 Constitution was abrogated...to give the illegal AG the power he needs to “fix” the next elections. Second, will the presiding election officers and Poll Clerks be military officers or supporters of the ruthless, power drunk junta or bribed officials. From this analysis we can safely conclude that there are far too many unanswered questions that suggest that the electoral system proposed by the illegal AG and Military Junta (to outsource the registration of Fiji voters and to use voting machines) is nothing more than another scam. It is also dishonest and a despicable attempt to deceive the people of Fiji and the world. The murderer Bainimarama wants the world to think that he is the head of the ruling Fiji military junta. But this is not true. He is not Fiji's ruler. After his Coup of 5 December 2006, the murderer Bainimarama recruited a lawyer Aiyaz Khaiyum as the illegal Fiji Attorney-General. Now, after nearly five years, the real Head of the illegal and repressive junta is Aiyaz Khaiyum. The sooner the murderer Bainimarama and the army leaders see it, the better it will be for them and for Fiji as a whole. Khaiyum played a dangerous game to ascend to the throne of power. He played the game of give and take with the murderer. Initially, he gave in to whatever Bainimarama desired and laid the political and legal strategy on how to achieve it. Khaiyum convinced the murderer to retain the 1997 Constitution after the coup. He was really preserving his Australian status and his legal oath. Having retained the Constitution, he recognized that if the 2006 coup was taken to court, the illegal junta would lose. So he worked out a heinous plan to remove Chief Justice Fatiaki, by forcing him to resign. Next was the case brought by the deposed PM Qarase. It was heard before a panel headed by the ubiquitous Anthony Gates who was promised the position of Chief Justice. The quid pro quo was to rule that the coup was legal. It was so ruled based on the theory of the Doctrine of Necessity. It’s a good thing the Doctrine does not apply to murder as well. Gates carried out his part of the deal. Qarase appealed the decision and, after an interminable delay, the case was heard by an Apellate Court. The Court reversed Gates’ decision and ruled that the coup was illegal, the regime was illegal and all acts by it are illegal. The murderer Baininarama took Khaiyum to task for what happened but the latter proffered Bainimarama a solution...abrogate the Constitution, assume full and total power and control over the country, and govern and rule by Decree. Bainimarama did as he was advised. Khaiyum, having savoured power, wanted more. To achieve it he had to accomplish several things. First, he had to create his own power base. Bainimarama had the Army and he had nothing. So Khaiyum roped in his family. Judge Nazat Shameem and her sister Shaista Shameem who resigned her Government post and joined the cabal. Khaiyum’s aunty Nur Bano Ali and her Accounting Firm did likewise. So did all members of their family. Soon, Khaiyum had a huge circle of people that had more power than Bainimarama and the Military. To ensure control over the murderer Bainimarama, Khaiyum conceived a plan for massive salary payments, which his aunty’s Accounting Firm dispensed. Khaiyum then had a choke hold over Bainimarama with evidence of corruption and fraud. Khaiyum moved to expand his power base in the regime’s administration. He influenced the murderer to endow him several Ministries to explain the high salary but really it was to expand his power outreach. Bainimarama went along with all of Khaiyum’s moves and countermoves believing that it was for his own good, while blind to Khaiyum’s real intentions. After all, Khaiyum has a university education whereas Bainimarama is an ignoramus. Khaiyum’s power circle then went after what they sought the most, Fijian land. While nearly 80% of the businesses in Fiji are owned by Indians, 83% of the land is owned by the indigenous Fijians. To access this prize Khaiyum had to remove two key stumbling blocks, the Great Council of Chiefs and the Methodist Church. The Great Council of Chiefs was dissolved through Khaiyum’s nurturing, for his own ends that Bainimarama had no clue about. Just like the 2006 Parliament of Fiji that remains non-existent. Khaiyum again used Bainimarama, while still staying in the background, by influencing the murderer to miniaturise the Methodist Church and to remove some of the more militant Fijian Church officials. The Church however held fast. So Khaiyum went about it another way. He persuaded Bainimarama that land use is vital to Fiji’s economic development and that a Land Bank was the solution. Subsequently, a Land Bank was created. The greedy, avaricious culprit Khaiyum controls the Land Bank. But Khaiyum is cunning. He knows that he can’t get rid of Bainimarama because the murderer controls the army and the army is the source of power in Fiji. So Khaiyum has to control the army through its Commander, the murderer Bainimarama. If you control the Commander then you control the Army. This is exactly the situation in Fiji today! The murderer Bainimarama rules the military junta only in name. The main power and brains behind the throne is Khaiyum and his inner circle. Khaiyum effectively manipulates the murderer Bainimarama to get the Army to do what he wants done, while the murderer and the army are blissfully unaware of what is really taking place. Bainimarama used the army to remove the Great Council of Chiefs, suppress the Methodist Church, marshal the Fijian people, take control of Fijian land and maintain total control of the country in the belief that it is for Fiji’s benefit. This is incorrect! It was for the benefit of Khaiyum and his inner circle. The murderer Bainimarama and the army have been puppets and Khaiyum and his inner circle are the puppeteers. It is also Khaiyum and his inner circle who are devising the ingenious and insidious plan to privatise and use rigged voting machines for the 2014 elections, if it is held. After the illegal and fraudulent elections, Khaiyum will have no further use for Bainimarama and he and his inner circle will be the ruling elite in Fiji. Khaiyum will have a battery of Sri Lankan lawyers and highly-paid Australian and New Zealand opportunists who answer to him, to back him up. As a young political activist, Khaiyum tried to build bombs to destroy Fijian politicians and political parties. Today, he uses Bainimarama, the army and the decrees to achieve the same objective. The murderer Bainimarama claimed that he had the support of regional leaders. This follows the “Engaging with the Pacific Leaders Meeting” that was held in Nadi, Fiji, 1-2 September 2011. However, the Official Communiqué from the Forty-Second Pacific Islands Forum meeting, which was held in Auckland, New Zealand, 7 - 8 September 2011, suggests otherwise. That Bainimarama’s support has disappeared. 30. Leaders acknowledged the Forum’s ongoing work to encourage and support Fiji’s return to parliamentary democracy in accordance with the Leaders’ mandates and the Biketawa Declaration, cognisant of the Leaders’ decisions at Port Moresby and Cairns in 2009, and Port Vila in 2010. 31. Leaders welcomed the convening of the Ministerial Contact Group (MCG) meeting held in Port Vila on 14 February 2011 but expressed disappointment that a visit by the MCG to Fiji did not occur prior to the Forum Leaders’ meeting and called for a visit to take place as soon as possible, involving meetings with a range of stakeholders. Leaders tasked the MCG to continue dialogue and engagement with Fiji and report to the next Leaders’ meeting. 32. Leaders reiterated their call for commencement of genuine, inclusive political dialogue in Fiji between parties without preconditions or predetermined outcomes. In doing so, they also reaffirmed the underlying values of the Forum, namely respect for democracy, good governance and the rule of law, and expressed their continuing deep concern at the deteriorating human rights situation and serious political and economic challenges facing the people of Fiji. 33. Leaders reaffirmed the clear commitment of all Forum members to encourage and support Fiji’s early return to parliamentary democracy, including their standing offer of practical assistance in addressing the challenges faced by Fiji. 34. Leaders agreed to permit Fiji to participate in PACER Plus meetings at officials-level only, given Fiji’s important economic role and links to prospects for broader regional economic integration. The Forty-Second Pacific Islands Forum was held in Auckland, New Zealand, from 7 to 8 September 2011 and was attended by Heads of State and Governments of Australia, the Cook Islands, Federated States of Micronesia, the Republic of Kiribati, the Republic of Nauru, New Zealand, Niue, the Republic of Palau, the Republic of the Marshall Islands, Papua New Guinea, Samoa, Solomon Islands, Tonga and Tuvalu. The Republic of Vanuatu was represented by its Special Envoy. New Caledonia and French Polynesia attended the formal session as Associate Members. Timor-Leste, Tokelau, Wallis and Futuna, the Asian Development Bank, the Commonwealth Secretariat, the United Nations (UN), Western and Central Pacific Fisheries Commission (WCPFC), and the World Bank attended as Observers. To almost all military dictatorships, apart perhaps from North Korea and possibly Burma, perceptions, especially international perceptions, are of greater importance than reality. The current Fiji military junta is no exception. From its very inception, after the murderer Bainimarama’s illegal coup in 2006, the regime has studiously slaved to present an image of international respectability. Chief proponent of this illusion is the alleged Attorney General and his think-tank. With studious care they in particular (amongst other illusions which they have fostered) have sought to create an image of an independent judiciary. Such an exertion on behalf of the alleged AG mirrors other efforts by the junta to give a false appearance of respectability. These are all false and do not reflect the truth. The alleged Attorney General, articulate and apparently sincere, has sought to weave a web of deceit over the eyes of the international community. Notwithstanding the systematic campaign of torture and abuse of human rights orchestrated by the junta which gives him a living more lucrative than any he could have dreamed of in his previous career in the Australian law firm of Minter Ellison. The alleged Attorney General has consistently asserted the continuing independence of the judiciary under his watch, nut the facts say otherwise. The alleged Attorney General has elaborately created alleged "independent" bodies for appointment purposes. He is the "voice of reason" of the military junta and more articulate and subtle than his puppet the murderer Bainimarama, whose paranoid ramblings he seeks to replace. The real truth about Fiji’s judiciary is evident in the recent statements by both the New Zealand and Australian Law Societies condemning Fiji’s military junta and the enforced demise of the Fiji Law Society. Fiji’s judiciary is not independent. 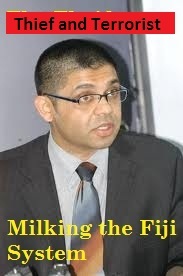 To call the Fiji judiciary independent is an abuse of language, notwithstanding the fine garments, which the junta has given the judiciary to wear, and notwithstanding the appearance of normality of court proceedings that the alleged Attorney General works so feverishly to maintain -- The use of “smoke and mirrors” to hide the true picture from the people of Fiji, especially in the rural areas. The alleged Attorney General was rightly stripped of his Australian Permanent Residence for his involvement in the latest coup. His activities will undoubtedly expose him to prosecution once the current military junta falls and a new democratic Government is elected. All those people currently masquerading as Judges will also suffer an equivalent fate. All current purported Judges, including those garnered by a worldwide trawl by the alleged Chief Justice, took office knowing the full legal and Constitutional position. That legal and Constitutional position was established by the Fiji Court of Appeal ruling of 2009, which declared the coup of 2006 to be unlawful and all actions taken under it to be unlawful. No alleged Judge currently sitting can claim ignorance of this basic truth. These purported Judges must have taken an oath of some sort or other, no doubt concocted by the alleged Attorney General. These are ALL False oaths. Taking any oath other than the proper oath to Fiji’s Constitution, which was endorsed by the Court of Appeal in 2009, is a false oath. The making of a false oath is a serious criminal offence. Such false oaths were the basis of charges laid against the leaders of the 2000 coup. Any person who makes an oath swears allegiance, no matter what else that person may say or do. Any oath taken by the current purported Judges, other than the proper oath, reveals allegiance to the military dictatorship. Involvement of alleged "independent" commissions does not solve this problem. A person who swears allegiance to the current military junta should be an outcast from the international legal community. Further, all current purported Judges are fully aware or capable of being fully aware of the campaign of torture and abuse of human rights currently being waged across Fiji by the junta against any real or imagined opponents. Simply put, by their oaths and their actions they pledge themselves to accept the validity of the " decrees" created by the alleged Attorney General that purport to preclude them from dealing with human rights abuses by the junta. They must turn a blind eye to the systematic torture while gilding themselves in splendid robes to adjudicate in respect of anything, but such illegal matters. Giving judgements, in certain cases, against the junta does not in any way falsify the above picture. The judges are not dealing with the one thing that matters most- the regimes campaign of torture. Current purported Judges would do well to resign now to avoid the wrath to come. All will in fullness of time stand trial for their misdeeds as described above. On Sunday, September 11, the United States of America observed the Tenth Anniversary of the Terrorist Attack on its territory. 2,973 innocent lives were lost. It was a day of infamy. It was a day of terror. It was a dreadful day that will long be remembered by the United States and the world over. On behalf of the Fiji Freedom and Democracy Movements in Australia and New Zealand, and on my own behalf, I wish to convey to the American Government and to the American people and especially to the families and friends of all those who died that horrible day, that we share your grief and sad memories. Our thoughts and prayers are with you. For Fiji, we are approaching the Fifth Anniversary of our fourth Coup, when the murderer and illegal Commander RFMF Voreqe Bainimarama, in a terrorist act, over threw the legally elected SDL Government on 5 December 2006. On that fateful day in December, Fiji and its citizens lost, not lives, but freedom, democracy, the rule of law, parliamentary government and the fundamental rights and freedoms of the individual and freedom of the media. Innocent people were later killed with Bainimarama’s blessings. This terrorist act by the murderer and terrorist Bainimarama has left the lives of the people of Fiji in ruins. It destroyed Freedom, Democracy and the Rule of Law and led to other acts of terrorism that include the military's illegal seizures of innocent citizens, men and women, who were beaten, tortured, raped and murdered. Bainimarama also beat two unarmed and defenseless women. Bainimarama’s terrorism that raised its horrible head in Fiji, on that terrible day in December, continues unabated. On behalf of the oppressed people of Fiji, and those that are unable to speak out for fear of being tortured, I humbly ask the nations of the world, and especially those in the South Pacific, to condemn the terrorist attack by the murderer, and the illegal Commander RFMF, Bainimarama and to join together with me and the Fiji Freedom and Democracy Movements in Australia and New Zealand to bring an end to Fiji’s continued terrorist nightmare. Bainimarama was part of the Coup of 2000. Bainimarama had also ordered the CRW into parliament in May 2000, then he betrayed them and Speight. Bainimarama was also under a secret police investigation for having a direct role in the coup. In November 2000, the CRW mutinied and tried to kill Bainimarama for betraying them. At the very start of the attack, Bainimarama abandoned his soldiers and ran like "grease lightning" down the steep bank behind Queen Elizabeth Barracks -- Setting a new world record for the Casava-Patch dash. A Colonel was quoted saying, " it was raining that day, but there was dust in the air." The Colonel was removed for saying it. Bainimarama was not capable of leading his men or ending the mutiny. Fortunately, there were other more experienced officers who saved the day. These officers have also been removed. Bainimarama, a true example of a "lamusona", while hiding in the Navy Base, learnt that Captain Shane Stevens had led the mutiny against him. Shane had been shot and was in hospital wounded. Bainimarama went to the hospital where, he said – before witnesses – that he intended to kill Stevens. His men had to talk him out of it. However, Five of the rebels were tortured to death. Dan Oakes, at the Pacific Islands Forum in Auckland, reported yesterday that FIJI'S stint as a pariah nation could be drawing to a close, as the New Zealand Prime Minister, John Key, hinted at a softening of the hard line Australia and New Zealand have taken against the island's military regime. The following statements and documents from former Senior RFMF officers and the CEO for Home Affairs clearly shows the murderer Bainimarama's premeditated intentions to commit the illegal and treasonous removal of the elected SDL Government for his personal benefit and gain. The murderer Bainimarama threatened PM Qarase to renew his contract as Commander RFMF or Government would be removed. The murderer then ordered his senior RFMF officers to plan for the removal of the Government. When the Senior officers, except Natuva, advised him against it, because his intentions were illegal and treasonous, Bainimarama had them all re-assigned or sent on leave. Effectively, these Senior Oficers were all booted out of the army for doing their jobs and standing up for the integrity of the RFMF. See Fiji Times article dated 24 February 2004, titled - Military Advises Officers to Quit. This article outlines the TRUE reasons why Bainimarama wanted these Senior Officers to Quit. So where are these Senior qualified, professional and loyal officers today. Where are Tarakinikini, Seruvakula, Baledrokadroka, Saubulinayau, and Driti. These were Senior Officers who stood by their oath of allegiance through the mayhem and confusion of 2000. They were in fact the Senior Officers who saved the country and the RFMF in the chaos of 2000. Bainimarama did not save the country in 2000. So the question to Bainimarama is why did he have them removed after they gave him sound advice. My theory, and given the documentary evidence, is that the murderer Bainimarama wanted a clear and unhindered path to achieving his goal from, instigating the removal of the Labour Govt in 2000, and removing senior professional officers who stood in his way of achieving his mission and goal in life, which is to rule Fiji and to prevent the police from arresting him. Bainimarama is ruling the the country now and his next step, is to become President of Fiji. The coup of 2000 and 2006 was never about Politics or about Race. It was solely for the benefit of Bainimarama and his lust for power and to save himself from being arrested. Bainimarama used the RFMF to achieve his mission! Or Listen to the interview here.. The Fiji problem is being viewed by all as purely a political matter. From my perspective however, as a former Fiji Senior Military Officer, it also has pertinent security and defence implications and applications for the South Pacific Region, and particularly for Australia, New Zealand and the United States of America. If we look at history and to what happened in Cuba then we should be able to benefit from its lessons. Cuba’s situation is very similar to what is happening in Fiji. Like Fiji, it began with a revolution. In January 1959 Fidel Castro overthrew the Cuban Government of President Fulgencia Batista. Today, some 52 years later, Castro has stepped aside because of health reasons, and his brother Raul is now President. Fidel, in the early years, like the murderer Bainimarama, also spoke of elections to return the country to democracy. It did not happen, it has not happened and it will not happen. Cuba was expelled from the regional Organisation of American States and the United States severed relations with it. Too late, way too late, there was a US sponsored Bay of Pigs invasion but it failed. In the meantime, the vacuum created by the US’s stand-off, led to the then Soviet Union moving in to Cuba and controlling it. Cuba then began to reach out to the countries in the Caribbean and Latin America, the same as Fiji is going with the MSG countries and some Polynesian countries. It led to the Cuban Missile Crisis of October 1962 between the United States and the Soviet Union. As other Caribbean countries fell under the influence of Cuba, the US invaded Grenada and removed the pro-Cuba government. We can avoid a similar situation if we act now. But history has a nasty habit of repeating itself. China, recognizing an opportunity from the coup in Fiji to expand its power of influence and to make the Pacific Island Countries geo-political, and a possible Sphere of Influence, acted quickly. It expanded its influence over Fiji with speed. So why didn’t Australia, New Zealand or the US do the same?.........this is for another statement. No criticism is being levelled against China. The PRC is acting in pursuit of its national interests, which dictates its foreign policy. The murderer and military Junta ruler Voreqe Bainimarama became a close friend, ally and collaborator of China. The PRC lavished attention, huge financial grants, excessive loans, private sector investments, and most important and relevant, Military Training and the supply of military material. Fiji is now a “satellite” of China. This situation is a carbon copy of the Soviet Union and Cuba. China, with Fiji’s illegal Chairmanship of the MSG, expanded its relations with MSG countries. In July 2010, China participated in the MSG Summit post-dialogue at the Fiji Inter-Continental Hotel in Nadi. It also participates in the Donors’ Conference at Pacific Island Forum Meetings. China also engages with some Polynesian countries and is also one of the most influential countries in the Non-Aligned Movement (NAM). Under the influence of China, Fiji joined NAM. This situation is certainly not in the national interest of Australia and New Zealand and its regional foreign policy. Both South Pacific powers need to act condignly, purposefully and effectively to bring an early end to the Fiji military Junta led by the murderer Bainimarama. The Fiji problem does not inhere with China. China saw an opportunity and grasped it with both hands. The problem lies with the Fiji military Junta and Fiji’s true enemy, the murderer Bainimarama. The ANZAC powers should not only be concerned but must also act to bring about the collapse of the Fiji Military Junta, as soon as possible. They should be informed by the Cuban Revolution, the Cuban Missile Crisis, the Castro Communist 52-year rule and its similarities to Fiji... with a Dictator Bainimarama, no rule of law, no fundamental rights and freedoms of citizens, total military control, no media freedom, no freedom of speech, no right to dissent, no right of assembly, no trade union movement, restriction on Churches and NO FREE AND FAIR ELECTIONS. It is also, in the interests of security and defence, that the United States collaborate with Australia and New Zealand to bring an early end to both the Military Dictatorship in Fiji. The Pacific Island Countries geo-political region is becoming a Sphere of Influence for China and this is not in the interests of the United States, Australia or New Zealand. The South Pacific ocean lanes are vital to the defence and security of the United States. Australia and New Zealand, close allies, have always been and should also remain the major powers in the South Pacific. With China’s growing presence in the South Pacific and its location in the North Pacific, its relations with North Korea and influence in the Pacific far east, it would have control of the Pacific seaboard of the United States. China also has an influential presence in the Caribbean and Latin America and the southern flank of the United States. With its massive Official Development Assistance (ODA), private sector investments and technical assistance, China is being called the new Super Power by military and political analysts. It is not in the national, defence and security interests of Australia, New Zealand and the United States for the Pacific Island Countries South Pacific geo-political area to become a Sphere of Influence of China. It is not in the interest of Australia and New Zealand to allow Fiji to become the Cuba of the South Pacific. Australia, New Zealand and the United States must act in concert with alacrity to bring an end to Bainimarama’s military junta in Fiji. The hold off in the belief that the illegal Fiji regime will hold elections in 2014 is ill-advised. Castro promised elections in Cuba in 1959 and today, 52 years later, there have been no elections. Elections in Fiji in 2014 will never happen. Australia and New Zealand must review its role in the Forum and, especially, their decreasing influence in the Pacific. The Fiji problem is not solely political, it also has defence and security implications for Australia, New Zealand and the United States. Action now, rather than later, will be of benefit to the region as a whole and free the oppressed people of Fiji. It was sponsored by the illegal, corrupt and repressive Fiji Military Junta deliberately and solely for the purpose of exercising due political influence over PIDS Representatives to achieve its insidious and evil objectives. Recognizing that the Pacific Island Forum meeting will be held in New Zealand from September 6-9, and no doubt having conspiratorially obtained a Classified Copy of the Agenda, the Junta set about its con-artist policy to miss-inform the representatives at the meeting about their evil deeds and to win support for the junta’s illegal and pernicious acts. To win over the Representatives to their evil cause and to convince them that all is bright and beautiful in Fiji, the PIDS meeting was held at the Inter-Continental, far away from the capital, in a sparsely populated area. The PIDS delegates were told that the RFMF soldiers and Fiji Police surrounding the hotel were there for security. The reality was that the junta wanted to ensure no opposition elements and/or disaffected people could speak to the delegates. This also meant sealing the delegates in the hotel. The only words, explanations and plans Delegates heard were from the illegal junta. Without recognizing it, Delegates were really in splendid isolation. Even the advertising, puff and propaganda video shown to Representatives were shown to Delegates only and the Fiji journalists were excluded. The Junta achieved its first aim...splendidly isolating the delegates and making them willing or unwilling partners to the junta’s evil and illegal plans. The Junta, via their infamous coupster, con-man and fraudster, Ratu Inoke Kubuabola, who is also Fiji’s illegal Foreign Minister, then proceeded on with the next objective. It was to convince Delegates that Australia and New Zealand are imperialists, and were out to colonize Pacific Island Countries. This is totally incorrect, however, it was used in an attempt to unite the Pacific Islands against Australia and New Zealand. Ratu Inoke went on to advise the delegates that the one way to do it was to support the Junta, oppose Australia and New Zealand and take control of the Pacific Island Forum Secretariat. The acme of the aim was to seek the removal of the current Secretary-General Neroni Slade from Samoa, and replace him with a Fiji citizen but, as I mentioned in an earlier statement, it was a classic case of the blind leading the blind. More appropriately, it is the evil crooks trying to scam the righteous. What the coupster cleverly and deliberately failed to inform the PIDS meeting, or maybe tricked them into believing otherwise, was that Australia and New Zealand contribute some 70% of the Budget of the Secretariat and both make significant foreign aid contributions for national development to PIDS. In other words, the con-man Ratu Inoke sought to convince the Delegates to kill the goose that laid the golden eggs. I know better sense will prevail in the Governments of PIDS. The PIDS Meeting and its splendid isolation was also another perfidious tactic to pursue the Junta’s regional policy concocted by the fraudster Ratu Inoke and that is to divide and rule... separate first the MSG countries, which it has done, then unite them with Polynesia, rule them and then use them to form a political bulwark against Australia and New Zealand. Recognizing also that the junta cannot attend or participate in the Pacific Island Forum Summit in Auckland, the splendid isolation PIDS Meeting was a means to influence individual Representatives, and particularly MSG countries, to speak on behalf of Fiji at the Summit and to oppose Australia and New Zealand. What was said and agreed to at the Inter-Continental will not reach fruition at the Summit. However, the infamous coupster Ratu Inoke has achieved one regional policy, he has split the region’s unity and solidarity and placed in jeopardy, its regional trade and economic arrangements. PIDS should examine the level of its exports to Australia and New Zealand and the countries of origin of its tourists. Their national political and economic interests are bound up with Australia and New Zealand and not the Military Junta. By its support of Fiji, PIDS are failing to realize that they are hurting themselves, which is another policy of the Junta...if we cannot receive benefits from Australia and New Zealand, then let us all be in the same boat. Actually, the Fiji situation should have been nipped in the bud. When the murderer Bainimarama promised to hold elections in 2009, Australia and New Zealand should have insisted on it being held. By adopting a laissez-faire policy towards Fiji, the Junta was given time and space to create anarchy in the country and split regional relations. It is time that Australia and New Zealand and all like-thinking States unite in a common effort and devise a common plan to move Fiji to elections, within one year, and restore freedom, democracy, the rule of law, human rights and Parliamentary Government. Know the whole truth and the truth will help you set Fiji free. ..........Are we still talking about Fiji! Where the "Methodist Church" re-elected the same people to President and Secretary General. But True to form the data will not be made public for the people of Fiji to verify it and give their version of the truth. All educated people know that data can be "re-arranged" to justify any statement. And that the data only matters when the same data is also made available to the public to verify its accuracy, which the murderer Bainimarama will never do. So we are back to the the murderer Bainimarama's M.O. (Modus Operandi or method of operation) where he and his dedicated bakewas are trying to manipulate the Forum leaders, like what the murderer succesfully did with the RFMF to support his 2006 Coup and save him from being arrested for his part in the 2000 coup and the murder of the CRW. The murderer forgets that the Pacific Island way is to not openly show disrespect. The leaders know the truth but out of respect they will not openly disagree, even when they know that the murderer Bainimarama is an idiot. 7. their acts to destroy the Indigenous Rights of the Fijian People through scrapping the Great Council of Chiefs and creating a Land Bank to steal ancestral Fijian Land. What the DATA also wont tell you is that there is now a popular movement internationally, in the region, and in Fiji itself, to remove the Fiji military junta and to restore democracy, parliamentary government, human rights and the rule of law. Adelaide, South Australia – this new Chapter of FDFM, that is joining the global campaign to seek the removal of the illegal Fiji military junta and the return of democracy, freedom and the rule of law to Fiji, was launched today by Ratu Tevita Mara. The small group of enthusiastic people of Fiji and Friends of Fiji, will use media campaigns, community conversations, youth mobilization, and lobbying with a wide range of civil society partners to promote a return of democracy and the rule of law to Fiji, across South Australia. You can click here to read Ratu Tevita's speech. Oh what a tangled web they weave when they set out to deceive, to coin a line from the Marmion (1808). And that is exactly what the Military Junta did, through a propagandist when he spun a make-believe fairy tale to the Representatives of the Pacific Islands Developing States (PIDS) at their Meeting in Nadi on August 31. According to the Fiji Sun, the propagandist, a Junta mouthpiece (with tooth decay), told the PIDS representatives that the illegal and repressive regime “will lift the living standards of all Fijians.” The junta has a peculiar way of showing it since, under its power and control, living standards are not being lifted but are spiralling downwards. Some 45% of the Fiji people now live in poverty. Hunger and starvation stalk the land. · the illegal regime’s stand against systemic corruption in the country. This is perhaps the biggest lie of all. The murderer commander Voreqe Bainimarama who, with his illegal Attorney-General, Aiyaz Khaiyum, pay themselves some $700,000 each annually. They keep their money in offshore bank accounts and refuse to disclose the amount to the people of Fiji. · Corruption in the Fiji National Provident Fund (FNPF), by the murderer Bainimarama and Khaiyum regime, has left it in a state of collapse. The future of 10,000 pensioners is now questionable. · Public Enterprises, including Air Pacific, administered by the junta and their incompetent Permanent Secretary, are collapsing. The motto in Fiji now is: join the illegal regime, fill your pockets, and open offshore bank accounts. · Another big lie spun is the junta’s intention to create fundamental principles in a new Constitution. It was the junta who, when Bainimarama’s coup took place, publicly announced that it fully supported the 1997 Constitution and that the Constitution would remain in force. They lied. Bainimarama abrogated the Constitution as soon as the Fiji Court of Appeal ruled, in 2009, that Bainimarama’s coup was illegal, the regime was illegal, and all acts by it are illegal. This means that the Peoples Charter is illegal, the decrees are illegal, any new Constitution will be illegal, and the 2014 Elections will be illegal, pursuant to the ruling of the Court of Appeal. So how can anyone believe that free and fair elections will take place in 2014. What the illegal regime also failed to tell you is that there is now a popular movement internationally, in the region, and in Fiji itself, to remove the Fiji military junta and to restore democracy, parliamentary government, human rights and the rule of law. In Australia and New Zealand, Freedom and Democracy Movements are operating. In Fiji, a policy of passive resistance by the people, the Methodist Church, the Trade Union Movement and the Viti Revolutionary Force has begun. The murderer Bainimarama and his illegal junta will fall and we, as a region, will need to work together. So through this statement, I humbly request that the learned PIDS representatives take the time to analyse and assess the accuracy of ALL statements presented to them by the Fiji military junta and its representatives. The oppressed people of Fiji need you to know the truth, and the “truth” will help set them free! The MSG held its meeting in Nadi, August 31, and, according to a Fiji Sun news report, made a decision to support Ratu Inoke’s initiative to replace Mr Slade. This decision is to be pursued at the upcoming South Pacific Forum Summit in New Zealand, from September 6-9. Yes, the murdering Dictator Bainimarama is well aware that when the coupster Ratu Inoke Kubuabola was Fiji’s Ambassador to Papua New Guinea, Ratu Inoke, it is alleged, took a financial advance from the Fiji Embassy in Port Moresby and never repaid it. Ratu Inoke has a strong motive for not returning democracy and the rule of law to Fiji, for he too will be prosecuted. TAUMU'A LELEI: What led you to speak out against Commodore Bainimarama? RATU TEVITA MARA: I have been charged for making seditious comment against Commodore Bainimarama and his Military Regime. But I don't ever recall saying seditious remarks to the Officer who made the allegations against me. It is allegedly said that I said it in South Korea. It seems my removal was pre-planned. TAUMU'A LELEI: Why do you say that? MARA: We have to take ourselves back to 2000 coup till the coup of 2006. A number of key senior officers were removed from the military. They were removed not for plotting against Bainimarama but for trying to keep Bainimarama on the safe legal side which was beneficial not only to the country as a whole but also protected the military as an institution. Commodore has been trying to remove the SDL Government of Qarase since 2001 when it was first voted in despite the army starting the SDL itself. The concept of the SDL Party came from the military council after the 2000 coup. The Commodore knows how to manipulate people and uses them when it suits and dumps them when he no longer needs them. TAUMU'A LELEI: So you began to doubt Commodore Bainimarama's leadership? MARA: Bainimarama's leadership was already in doubt in the events of 2000. That's why those senior officers had left. I questioned him why he deviated from the road map in 2007 which was suppose to lead us to election in 2010. In 2006 the Senior Officers who were still in the army gave him the benefit of the doubt. He claimed that were a lot of corruption in the SDL Government but so far nothing significant being revealed. That benefit of the doubt came back to haunt us. It clearly reveals now the main purpose of the 2006 coup was to cover what he had done in 2000, supporting the civilian coup and using part of the military for the coup of 2000 and also plotting to remove the SDL Government from 2003 until it took place in 2006. TAUMU'A LELEI: So Bainimarama led the military to believe that the way to stop the SDL corruption as he claimed was to remove the Government? MARA: It was not only Commodore Bainimarama who wanted me to go on leave in 2010 but also the Attorney-General, Aiyaz Saiyed-Khaiyum. The Attormey-General has been removing people who are close to Bainimarama. He has removed the whole military council since 2006 and the only one left now is Colonel Aziz. Teleni, former Police Commisioner and Navy Officer, has gone to China, and Brigadier Driti and me were charged and removed last year. TAUMU'A LELEI: With dueʻ respect to late President Iloilo, how active was he in his office especially between 2003 and 2006? Some said Bainimarama used the office of the President for his own advantage because the then President's health was deteriorating. MARA: Ratu Iloilo played a prominent role in 2000 when Ratu Mara the then President was removed by Bainimarama from Office. Commodore Bainimarama was deceitfully using the president, the late President Iloilo. In 2003 he wanted senior officers to draw up a coup plan to remove the SDL Government and in 2005 he threatened the Prime Minister Qarase to renew his contract. 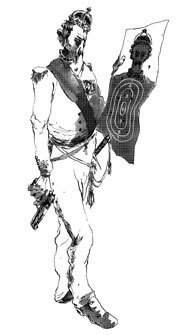 Legally the Commodore should have been tried for treason but he used the President, who is also the Commander in Chief, to save himself. He was deceitfully manipulating the President's office then for his own favours and to keep him afloat until he conducted the coup in 2006. The military takeover was not for the benefit of the country but for the benefit of one person to cover up himself from what he had done. TAUMU'A LELEI: You were in the Fiji Army and part of the Military Regime since 2006 and now you are outside of Fiji looking inside. How do you see the military regime from an objective point of view now? MARA: This is eleven years since the millennium and to be having a Military Junta in the South Pacific in this modern times and age is totally uncalled for. I think Fiji has been going through three Constitutions since independence from the British in 1970 and the fourth is on the making. On the other hand this is our fourth coup. Since independence we have been having a coup every 10 years and if we go from the first coup in 1987 we have been having a coup every five years. Four Constitutions and four coups since independence. It's unbelievable. Now who gave Bainimarama and Khaiyum the mandate to make changes in Fiji? TAUMU'A LELEI: From information coming to you from some members of the Fiji milittary, I am sure, what is the current situation in the army like? MARA: In the Fiji military all is not well within the military, there is divided loyalty. Soldiers who are loyal to Bainimarama and soldiers who are loyal to Fiji, loyal to the Constitution, loyal to the people of Fiji. People who are loyal to Bainimarama are loyal to his dictatorship and the dictator uses it for his own benefit. Let us wait and see what will happen. TAUMU'A LELEI: The Unions are challenging the new Decrees which remove the workers' rights. What do you think of that? MARA: The Unions are now calling for discussions in Fiji for the removal of illegal Decrees that call for the removal of all Unions in Fiji. The Decrees remove and control institutions and no one can say what one wants to say, no freedom of expression. I can see there will be no election in 2014. He has no intention of going back to elected government. He abrogated the Constitution in 2009 for he knows if he goes back to election he will be prosecuted and investigated for all his doing since 2000. TAUMU'A LELEI: What do you hope to achieve by visiting Pacific countries and meeting their respective leaders? MARA: I am hoping to visit countries before the Forum in Auckland next month. Since I have left Fiji the support have growing especially in returning Fiji to democracy, even if it means removing Bainimarama and if that happens he should accept it. The Melanesian Spearhead Group (MSG) are supporting Bainimarama's Military Junta. I think they should not support dictatorship nor military junta for they are telling others that it is acceptable in the South Pacific. I call upon MSG countries to withdraw their support so as to give a strong message to South Pacific countries that such actions are unacceptable. TAUMU'A LELEI: How do you see the Church's role in returning Fiji to democracy? MARA : The Church has always play a major role in Fiji and in many other countries throughout the world. Look at what happened in the Philippines, and Poland in the past. It is true the Church should stand for its Christian principles but the Church also stands against oppression and injustice. Many have been detained illegally, tortured and murdered since the 2000 coup by the military. Yet the Church is more silent than vocal. The Church should not be over cautious and trying to be politically correct but proactive to stop oppressive regimes. It is part of preaching of the Gospel. TAUMU'A LELEI: Is there anything else you want to add? MARA: I want to thank the Royal Family of Tonga, the Tongan Government, the Church Leaders of the Catholic Church and the Free Wesleyan Church in TongaI have spoken to and asked to pray for Fiji's return to democracy. I also want to thank the international community, and leaders of Pacific countries I have visited including Australia and New Zealand, and people within Fiji and outside of Fijii who have joined with me in support of taking Fiji back to democracy. It is my hope that I will be back to our beloved Fiji for Christmas. The murderer Bainimarama and Khaiyum’s brutal dictatorship and tyranny on our own people has reached a critical moment. The oppression, corruption, poverty and brutality is rising, a 12 year old boy had his fingers broken under Bainimarama’s orders, but so is the level of anger and frustration. Protesters in the form of the new VRF group have taken it upon themselves to take action following the disrespectful treatment of the Methodist Church leaders and the cancellation of the Methodist Conference. Fiji is passing the point where brutality and threats by the military junta will no longer silence the people. The oppressive situation needs to end before it gets out of hand and there is violence and/or loss of life. We must not reach this point. Therefore, I call upon all members of both the Fiji Police Force and the Fiji Military Forces, loyal to Fiji, to remember your sworn oaths to protect the citizens and people of Fiji. As the sworn guardians you must take back control of your once proud institutions from the murdering Bainimarama and his tiny group of dedicated power hungry cronies. You must restore respect for the Rule of law and restore the peoples trust in the security forces. Under the murderer Bainimarama you are regularly being instructed to turn a blind eye to breaches of the law, corruption and to the brutality on our own people. This is not what you joined up for. Our people are suffering, you and your families are suffering, and so is Fiji. To help end this you need to turn your focus on to Fiji’s real enemy: the murderer Bainimarama. With his laughable promises of free and fair elections in 2014, his continued theft of public funds, lies to the international community and the continued torture of our own people, the murderer Bainimarama has lost all credibility. Bainimarama betrayed the loyal CRW soldiers and had them silenced to cover his involvement in the 2000 Coup. The murderer Bainimarama again manipulated the military and staged the 2006 Coup to protect himself from being arrested for his involvement in the 2000 Coup and the deaths of the soldiers. This evil all needs to end now. We all need to unite and say enough is enough! Please support the Methodist Church and the Unions, and start passive resistance now. Together we shall rebuild our beloved Fiji -- A democratic, prosperous and peaceful Fiji for us and our children, and our children’s children. U.S. Embassy cables from Suva have confirmed what I have been saying all along to the Governments and people of Australia, New Zealand and the Pacific Island Countries, including the people of Fiji ― Beatings and intimidation of innocent Fiji citizens is the current strategy being used by the murderer Voreqe Bainimarama and his Junta to control Fiji. The cables have also confirmed that Bainimarama himself handed out some of the beatings. We know he has done this to unarmed and defenceless women, which explains why he so easily abandoned his men to save himself and set a new world record for the casava-patch dash! I sincerely hope that the Governments and people of New Zealand, Australia and the Pacific Island Countries, especially the member countries of the Melanesian Spearhead Group, sit up and take notice of Bainimarama’s evil and brutal rule and the oppressed people of Fiji. People of Fiji, in the villages and fields, in the factories, in the security services, and in our beloved Fiji, we must act now to take back our country from the murderer Bainimarama and his tiny group of dedicated parasites (bakewas). We need to end this nightmare in Fiji now and restore freedom, democracy, the rule of law, economic and social development and prosperity to Fiji. We can achieve this if we unite our efforts and work together to remove the murderer Bainimarama and rebuild our Fiji. Therefore, I urge the Methodist Church and the Unions to continue to resist the illegal repressive regime and I call on all other Churches in Fiji and people in Fiji to render their support to the Methodist Church and to the Unions. I welcome the Viti Revolutionary Forces and congratulate them for having the courage to stand-up against the murderer Bainimarama and his dedicated bakewas. We can apply passive resistance now. This can include going-slow at work, not going to work, distributing confidential regime documents and disrupting services. The Freedom and Democracy Movements in Australia and New Zealand are also playing their part to help bring about the downfall of the Bainimarama regime. They are also canvassing their governments to apply tougher sanctions on the regime and, in particular, tough sanctions on all businesses and individuals based in Australia and New Zealand that support the murderer Bainimarama and his junta ― Solidarity Forever. Together, and with God's blessings, we will topple the murderer Bainimarama, the Military Junta and his dedicated bakewas.